The Abdominal Release is also called the Diaphragmatic Release. The Diaphragmatic Release helps the broad ligament relax, giving baby more room to get into position for labor. This simple myofascial technique can be learned by a partner or friend. I learned this from Carol Phillips, DC. The release is a subtle physical technique using the lightest pressure possible. I repeat: Lightest touch possible! The upper hand does not rest on the abdomen, that would be too much pressure for the fascial response we want. Actually, an electrical circuit forms from the contact of the helper’s two hands. Some people say it is “energy” work. Though all matter is energy, I disagree with calling this technique an energy technique because the light pressure is a type of compression. We need the light touch for the fascia to respond. If we press, we’ll be going to the level of the muscles and the fascia will be “pinned” down by the force of even moderate pressure (like the pressure of a hug, for instance). 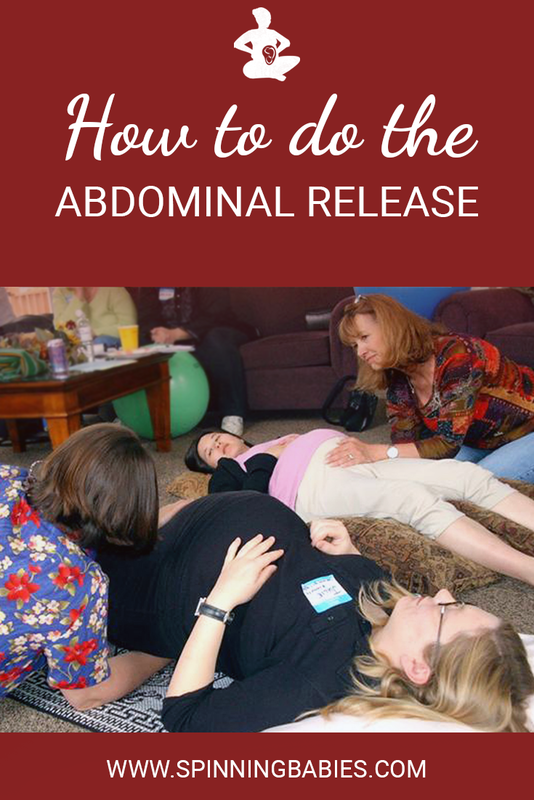 Why do the Abdominal Release? Can it Prevent Posterior Labor? A successful series of abdominal releases improves fetal positioning, as well as the woman’s comfort in late pregnancy and labor. Consider doing this at least monthly during pregnancy, or weekly on a regular basis. The Diaphragmatic Release may help “untwist” and “untighten” possible snags or thickening in the abdominal fascia or the muscle fibers of the broad ligament. Prevention of malposition in labor is a possible and even probable reward for weekly use. Try it weekly for 20 minutes. Any time. It often takes 10 to 30 minutes, depending on the individual. Longer is luscious. The mother can lay on her back or side. If on her back, she can be slightly propped up by pillows. Her weight should settle through her back though, not her bottom. Loose clothing may seem to help make this technique a success. The helper uses the palms of each hand to ‘hold” the woman but applies no pressure. The top hand touches the lower abdomen. Use the hand that will end up having the thumb “point” in the direction of the woman’s upper body, or navel. The light pressure means the helper can’t rest the hand on the woman’s abdomen. That’s too much pressure. The bottom hand is horizontal across the sacrum and soft or passive. The mother lays on the bottom hand. Her weight as she relaxes “opens” her back over the wedge-shaped palm of the helper. Now, the mother breathes as if she is relaxed and falling asleep. She can sleep, rest or have a pleasant and soothing conversation with the helper. Within moments, and the time varies with the woman, the helper will feel subtle movements traveling slowly (usually) between his or her hands. There is a delay between the hands of a few seconds. The movement may feel like flutters or like waves. A fluid motion might be noticed, or something like tapping or little pops. The woman can usually feel them, too. They are light enough to be missed unless the helper is quiet in her perceptions. The two of them continue to “do” the abdominal release until the motions stop. Here, Midwife Shawn Walker does an abdominal release with our Spinning Babies volunteer in Norwich, England. 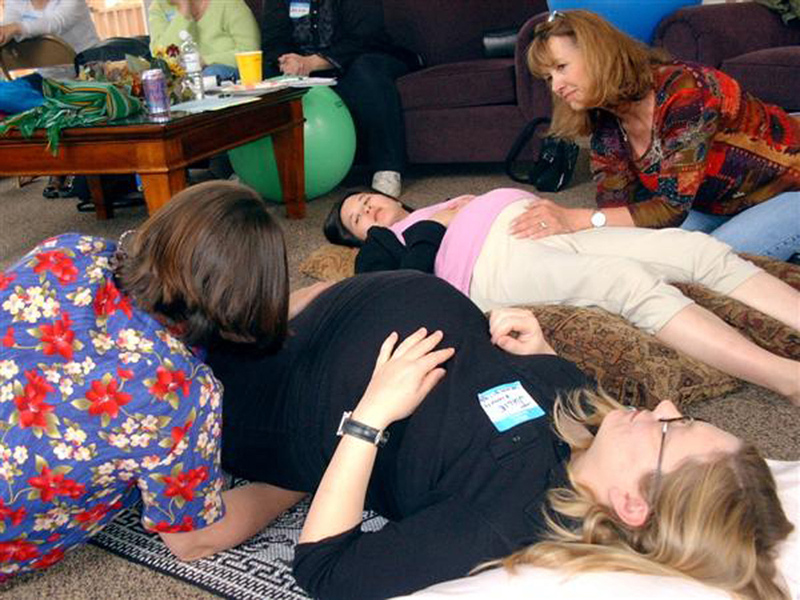 Learn more about how to do a diaphragmatic release from an article in Midwifery Today. When a woman can’t lay on her back, she can stand and use the Standing Sacral Release instead. Her helper sits beside her, facing her, in a comfortable way. You tried it by it didn’t “work”? Practice holding a balloon between your palms so lightly that if you held it with any less pressure and it would fall towards the floor. That’s the amount of lightness I’m talking about using in this technique. Light touch is still touch! You can learn to do this technique with another trusted person, but you may find professionals who do this type of fascial work along with Chiropractic or Osteopathic, Cranio-fascial or craniosacral, and therapeutic massage. The abdominal release can be done weekly, or once only, in pregnancy and/or in early labor. I suggest it whenever there is a fetal malposition, heartburn that repeats, or the pregnant woman feels uncomfortable or even in pain when the baby kicks. 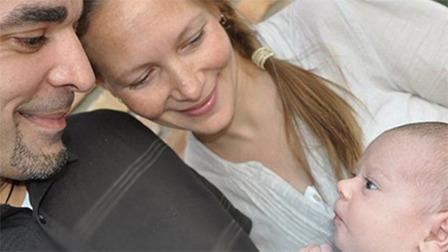 Some midwives have used this technique regularly in pregnancy for easing childbirth. This can be done before or after Rebozo Sifting, the Forward-Leaning Inversion and other 1st Principle activities to help Balance.